I used this cute Rachelle A Miller image called Puddles of Fun. I stamped it twice and cut out the largest duck and then glued yellow flower soft on it. I added some brads and a cute resin flower. The paper is from Authentique. So yummy! I'd love it if you played along with us this week. Play along with at least two of our Sketch and/or Recipe challenges by the end of the month, and you’ll be entered to win YOUR CHOICE of TWO PWCO RUBBER STAMPS OR November’s PaperCard Kit! You don’t have to use PWCO images to play, but we’ll throw your name in for the prize twice as often if you do! So cute Janet! Love how you've done the main image! This is stunning! 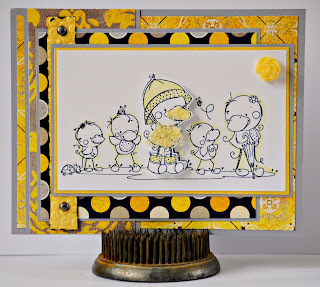 Love the yellow border and Authentique papers! !